Chocolate coins are available in a variety of imprinted images on gold foil. 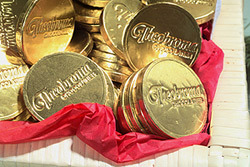 Personalize your company’s gifts or wedding favors with Theobroma’s own chocolate coin collections. Available in gold (milk chocolate, or dark chocolate mint), or silver (milk chocolate) foil, custom designed coins are available with just about any image you want. See your name and logo on delicious chocolate gold! At no extra cost we will imprint your coins. With a wide variety of images you can’t go wrong! Create your own coins! With about 2 weeks lead time, and a low $75 one-time set-up charge, you can customize your coins with your very own images. Camera ready, or laser print black and white art work is required for all customized coins. For weddings, or other special occasions, create your own artwork, or choose from our 24 wedding designs. Remember, we can imprint the other side of your customized coin with one of our in stock designs at no extra cost. Purchase up to 250 chocolate coins for .50 cents each. Please call us for volume discounts, then package your coins in a rack, or special party favor. Local delivery, and shipping nationwide is available.